6.) How about this killer photography? I like the “Noe cop” cradling a bag of groceries. I mean, the best I could muster was this Twitter tweet, but they delivered a joyful, action-packed feat of storytelling. They’re delish. However, they do claim Dolores as part of da Noe. What do we have to say about that? they’re probably just thinking everything south of 19th & west of guerrero is noe….because mostly white people live there now. viva la mision, in all its diversity. dolores park will never be in now valley. that is sick. Truffle guy is so hot! Well, look at a district map (that’s a .pdf, btw) — Dolores Park is in D8, which also encompasses most (?) of Noe, too. When I lived at 23rd and San Jose I was in D8, which was right on the edge of D9, and that was strange because what did I care about Noe issues? Nothing, is what. Also: When they say “da Noe,” are we supposed to be reading that like, “No,” rather than “No-ee”? Because Fresno has had dibs on “tha ‘No” for a long time. i think you really need to be on the south slope of that hill to be truly noe. emotionally i mean. that said, dolores x liberty is pretty noe-like. and 16th & mission, which is decidedly “mission”, is actually d6, which is mostly soma & tl. believe it was annexed into d6 in a re-districting exercise. go figure. I’m thinkin it’s the closest park for Noe people and that’s why they feel like it’s in “da noe”…I read that “in da noEEE” though. I say the E.
Noe people can claim the mom-and-baby part of Dolores if they want, but THAT’S IT! Dolores = Mission, as in ‘Mission Dolores’. Anything with ‘Dolores’ in its name is ‘Mission’, regardless of geographical location or other-neighborhood-esque utilization on subtle levels (energetic, emotional) or gross levels (“under the bridge”, style of home, ethnicity (e.g. white) of occupants, importation of babies of ethnicity into park from home of style); districting into “zones” is more a planning thing than a thing connected with any realities of ‘hoodness (including “Stop American Apparel” zones ). 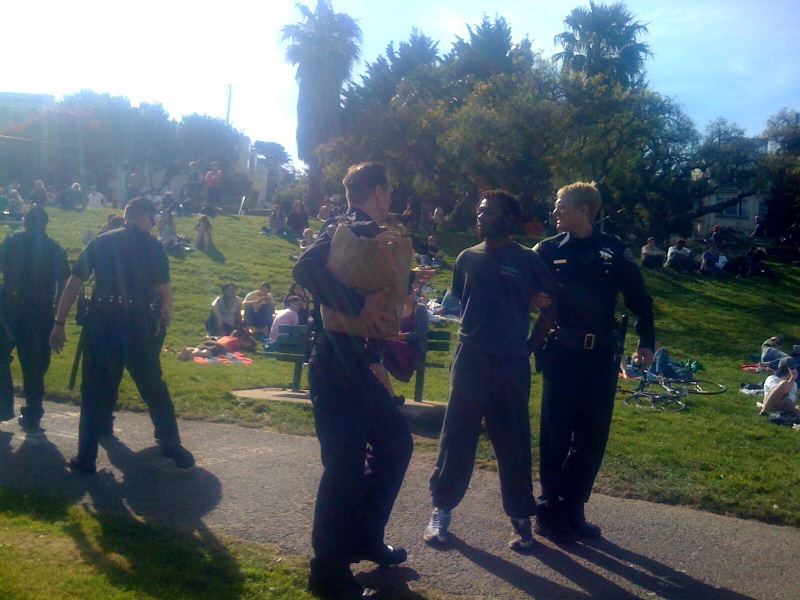 Crazy- the Dolores Park turf war is on. I live on Liberty near Dolores and we call the hill Dolores Heights. And surprise, we care about the park too. I have already started the petition to rename the park *Noe Dolores Park*. @newshound – it’s a good point you make. who really cares what hood people think the park is in…long as they love it and take care of it…. zinzin & newshound, nice points. but what about a sticky-tag turf war between mission and noe teams? i’m down for a dog show! Clearly, the dividing line is the 19th street “promenade” — Noe to the south and Mission to the North. That pavement strip down the middle of Dolores Park? No man’s land! Let’s rumble! how can i get rid of them easily? the features are the arsenic free display glass, it is bfr free, mercury free lcd display, it is pvc free and recycable alumimium and glss enclosure. work station – mobile or permanent? in addition, most models will also play files in other formats such as avi, wma and wav. of course, the digital age we live in takes note of electronic devices like computers and cellphones. selma additionally towards the bodily therapist wage, you are able to appear ahead to other standard advantages like the 401(k) strategy, incentives or join reward repayments, participation in any cost savings strategy that’s backed from the business you’re operating in and so forth. the complete package deal therefore gets to be a wholesome 1 and could be nicely really worth time and energy you invest within this occupation. there are many different kinds of website, but each has to be set up in web space that is provided by a web host. you will find lots of web hosting services online, and you have to decide which is best for you.